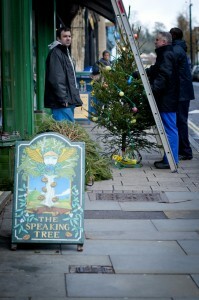 I’m not sure what the speaking tree was saying, but whatever it was, the tree chaps don’t look too happy about it! So after a full English at the Royal Lion (the works – egg, bacon, sausage, tomatoes, beans, black pudding and mushrooms) we trotted down to the seashore for a couple of hours. Wilcey borrowed the Lens Baby and braved the steps to get right inside the waves, whilst I had a go at beach huts. I’ve always wanted to do beach huts, but those at Lyme Regis are photographically disappointing since they have flat rooves and actually they look like a row of dodgy lock-up garages. We decided to amble homewards and stop off somewhere en route, which transpired to be Glastonbury, which was …. errrr … interesting. The problem I had with Glastonbury was that all these shops with weird and wonderful mystical names seemed to be selling the same sort of toot that you can buy at any decent shabby chic emporium, so I was failing to see where the “magik” and the “mystery” were.